setting off on the Western Flyer for an epic adventure! What kind of stuff you might ask? Plants! Basically, many deep-sea beasts have specialized to live on woody substrates and I wanted to test whether the kind of plant matters to the beasts that colonize it by sinking several different plant species in deep water. Please see my previous post on why land plants are important to deep-sea critters for an explanation of why I wanted to put woody stuff in the ocean and how I prepped it for sea. One thing I forgot to mention is how I actually tracked down the wood I wanted to sink. I basically emailed or called every tree service in Berkeley and got in touch with the local botanical gardens and the city. The most difficult thing to find though was tree fern and I was lucky that there is a tree fern enthusiast right here in the east bay who has a website called Ferntastic! and happened to have a chunk of dead tree fern I could sink. Amazing wood resources aside, I was able to get material from ten different plant species, get them prepped for sea and down to the Monterey Bay Aquarium Research Institute where I would be setting sail with Jim Barry et al and Craig McClain (Dr. M) on the Western Flyer. 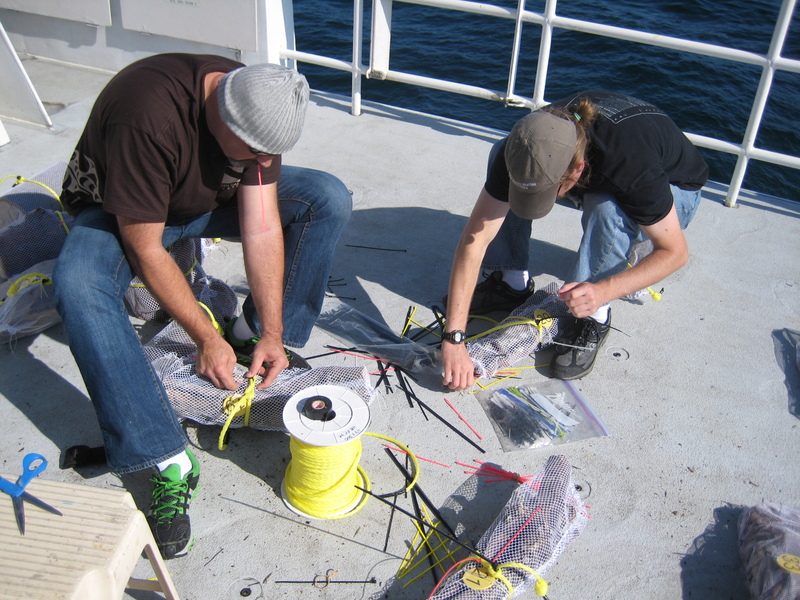 There were several objectives for our 6 day voyage including doing transects and collecting animals from varying depths for projects in the Barry Lab, resetting the FOCE experiment, retrieving logs that had been sunk by Dr. M 5 years previously, and sinking the plant material I had collected. 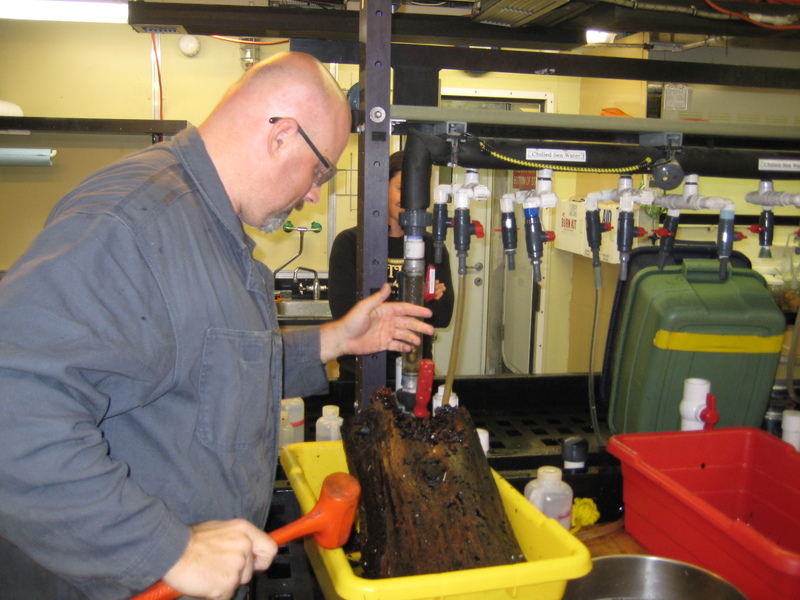 In Dr. M’s excellent post on Deep-Sea News, you can read all about the whole process of wood community formation, from how the wood gets to the bottom of the ocean in the first place to the community that colonizes it and the holey remains those critters leave behind. Wood deployment was slotted for the second day, so while others were retrieving experiments and setting up sea urchin races (FOCE is like a racetrack with lanes and hurdles for sea urchins with tasty kelp at the other end and different concentrations of CO2), Dr. M, David Honig (a graduate student at Duke working with Dr. M on the wood we would pull up), and I tied polypropylene rope to the wood bundles to help the ROV pilots grab the bundles with the ROV arm and loaded it up into the elevator. One lesson I learned is that you can never bring enough zip ties on a cruise, we used them to secure knots in the rope, attach rope to the mesh to prevent slipping and then secure the bundles to the sides of the elevator, which you’ll see was a key foresight by Dr. M given the next morning’s events. Prepping the bundles for deployment, thanks guys! 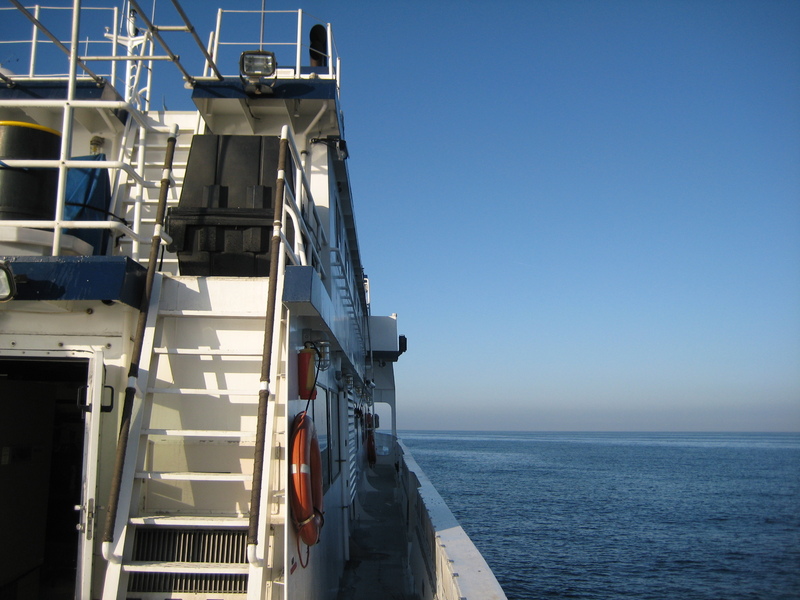 6am the next morning: The crew is on the back of the ship getting the elevator set to sink and the ROV Doc Ricketts is being deployed to go find the elevator on the bottom. I watch as the crane lifts the elevator with all my wood bundles off the back of the ship and down into the water. Now, the surface is the roughest part of the journey, and the latch holding the bundles in came loose! Good thing we zip tied all those bundles to the sides of the box! Only bundle number 20 escaped, and I thought we would lose it, but miraculously it got caught on one of the elevator’s screws and came back up safely onto the deck. After re-securing the latch, the crew was able to deploy the elevator with no further incident, and it would be 2 hours before the ROV completed its 3200m journey to the bottom, so breakfast time! One thing about research cruises is that there is no chance you will go hungry, Patrick, the ship’s steward, prepared three delicious meals a day and then there were plenty of things (including a dedicated ice cream freezer) for your snacking pleasure. 2 hours later I step into the ROV control room, think mission control, three pilot chairs face a wall of monitors tracking the topology with radar, the position of the ship and ROV, changes in water temperature and chemistry, and several different camera views. Two of these chairs are occupied by ROV pilots who fly the ROV and use all the manipulative features like arms and suction hoses to do the bidding of the scientists (muah hahaha). The third chair is for someone to control the HD camera and make sure it’s focused where the ROV pilots need it (I got to sit in this chair a bunch, which was really exciting!). Behind those chairs are four airline chairs for spectators and people taking notes or directing what they’d like the ROV pilots to do. 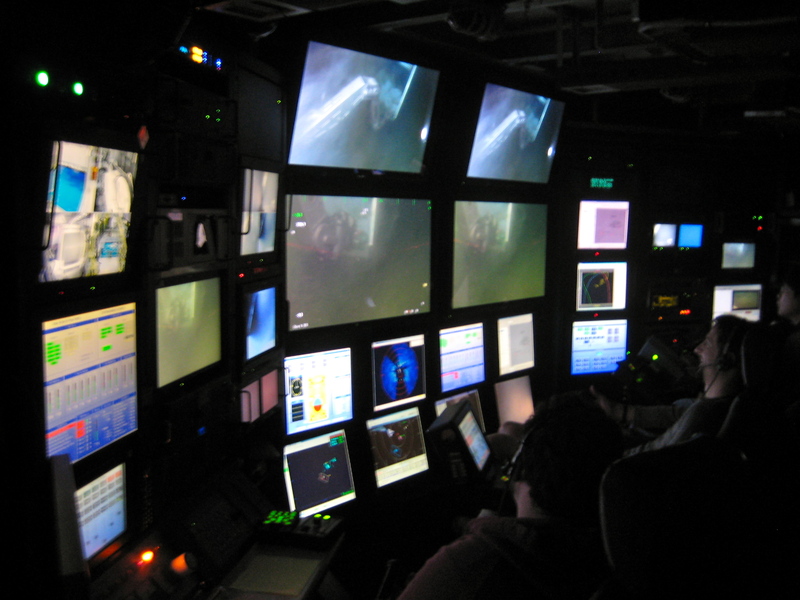 The ROV control room, feels like you’re down there with the ROV! The ROV is at the bottom tracking the elevator with a beacon and the radar (the elevator isn’t that big, but it’s so flat down there it shows up pretty strong on radar). The pilots have found the elevator and all the bundles are still nestled safely inside, phew! Now to get those babies out on the sea floor to start being colonized. 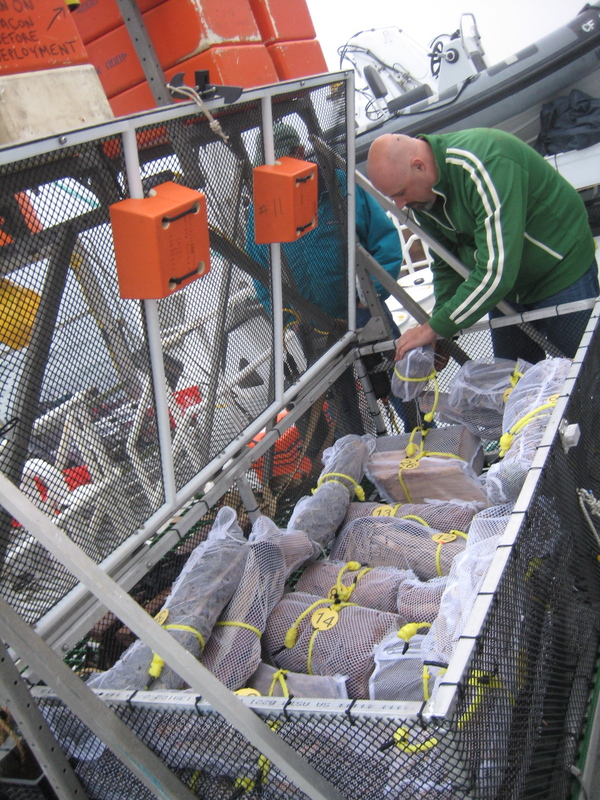 Basically, the pilots used one of the mechanical arms to unlatch the lid and then put about 10 bundles in the drawer of the ROV, then they dropped them in a line about 3m apart from eachother as if it was a paper route, just dropping them a little above the seafloor and letting them lie. We nabbed a picture of each one and then went back and did this two more times to get the rest out. Okay, so every time I’ve told someone about this project the first question I get is, “how are you going to anchor the logs?” or something similar, but here’s the thing, the pressure increases by 1 atmosphere (ambient pressure is 1 atmosphere) for every meter of water, so by around 100m deep all the gas in the logs that would cause them to float is pushed out and replaced by water, at 3200m this is no problem. Also, the currents are so slow that we are not too worried about the bundles being swept away. So with the new bundles successfully deployed, we could use the rest of the dive to retrieve Dr. M’s logs that he had sunk 5 years ago and see what goodies they contain. Based on the cliffhanger at the end of his post I think we all have something exciting to look forward to! 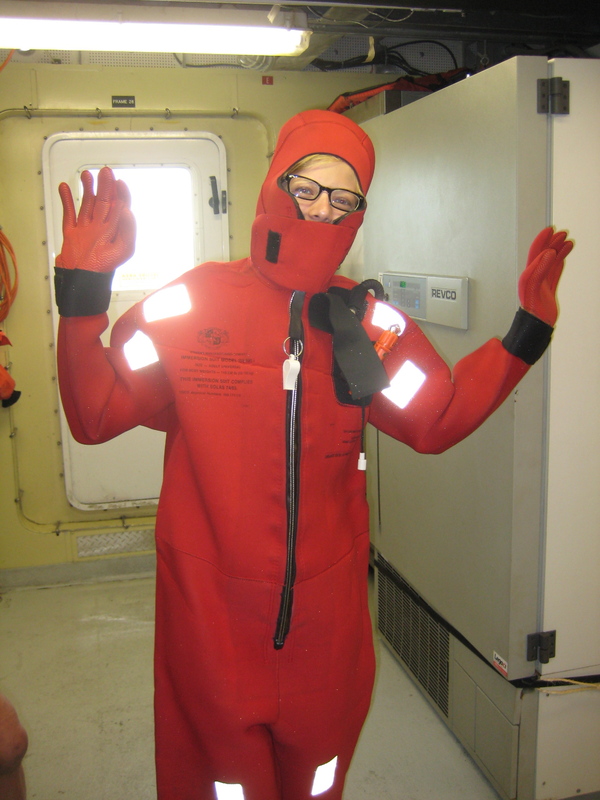 Before I sign off, I have to tell you about one other unexpected hiccup that happened at sea. You remember the problems we had with the latch on the basket of the benthic elevator? Well, it was still a problem when it came back to the surface with Dr. M’s logs in it and by the time the ship made it over to the elevator, three logs had been lost and sunk back to the bottom. We thought we would never see them again…but after doing some work at another site the next day we took a reaaalllly long transect back towards the “Deadwood” site, and guess what?, the ROV pilots found all three logs! Isn’t that amazing? Thinking back to last October, I’m still amazed they found them, and Dr. M was so happy after being so upset over the loss of data. So all in all, a great first research cruise for me and I hope to be getting back out there in a year and a half or so to retrieve the wood that is sitting on the bottom…hopefully attracting many interesting beasts. You are very lucky to have the chance to learn the things that you are learning. Your professor is one of the last of an unnaturally destroyed field. Brave scientist. Thank you Clint! I feel very lucky to have had so many great opportunities to work on things that interest me while working with amazing people in beautiful places.